This recipe comes from "Tacolicious," the cookbook from the eponymous San Francisco chain of full-service Mexican restaurants. This recipe is a variation on a traditional Mexican pickle that is served alongside the restaurant's tacos. 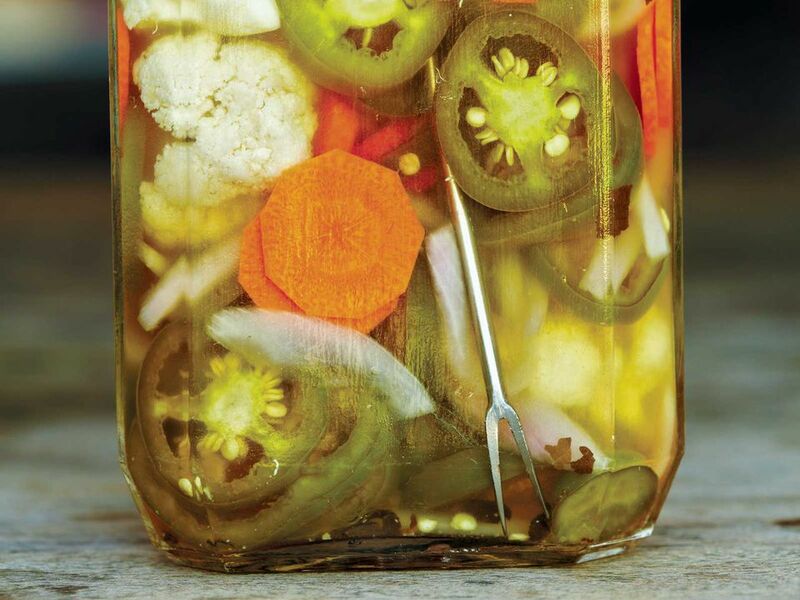 Instead of discarding the brine after pickling, the restaurant serves it as a chaser, or pickle back, with shots of tequila. The spicy, salty brine makes for a brusque palate cleanser between shots. Because this recipe calls for rice wine vinegar, which is less than 5 percent acidity, it cannot be canned via water bath canning ​but will keep, refrigerated. When it comes to setting the table in Mexico, this mix of spicy pickled vegetables, also known as escabeche, is almost as expected as salsa. At Tacolicious, the escabeche includes cauliflower, but most typically you will see jalapenos, carrots, and onions. Unless you have the time and the desire, do not worry about removing the seeds from the chiles. Try experimenting with a chunkier version, too, leaving the jalapenos whole and cutting the carrots into large pieces. The origin of the word "escabeche" is Persian; it was brought to Spain by the Arabs likely during the Moorish conquest of Spain in the Middle Ages. The word derives from al-sikbaj, the name of a popular meat dish cooked in a sweet-and-sour sauce, usually vinegar, honey or date molasses. The dish originated in Mediterranean countries like Turkey and Lebanon but has spread all over the world in one form or another usually representing a type of food that is vinegared or pickled. It is known as escabecio in Italy, savoro in Greece, and scabetche in North Africa. Put the cauliflower, carrots, onion, and chiles in a wide-mouthed quart canning jar or a heatproof glass or ceramic bowl. Combine the vinegar, water, sugar, salt, cloves, oregano, bay leaf, and garlic in a saucepan and bring to a boil over high heat. Remove from the heat. Place the jar or bowl in your sink to catch any overflow and carefully pour the vinegar mixture over the vegetables. Let sit for about 1 hour, or until completely cooled. If you have used a jar, screw on the lid. If you have used a bowl, transfer the vegetables and liquid to a plastic container with a tight-fitting lid. Let sit at room temperature for 24 hours before serving. The vegetables will keep in the refrigerator for up to 1 month. A rad dish: Some escabeche purists claim this popular dish cannot go without onions, however, if you are going for an escabeche that is entirely crunchy, ditch the onion and add radish. If you do, expect your escabeche to take on a more reddish hue than the red onions would have imparted. Quick saute: Some variations on this dish call for sauteing the veggies prior to submerging in the vinegar mixture. This can bring out the veggie flavor more, however, it will guarantee a soggy escabeche. If texture matters more, skip this variation. Why Did My Garlic Turn Blue When Pickled?